(Mens XL) Ugly Xmas Sweatshirt! Santa Carried Away by Teddy Bears!! Puffy Paint! Home > Ugly Christmas Sweaters > Ugly Christmas Sweatshirts > (Mens XL) Ugly Xmas Sweatshirt! Santa Carried Away by Teddy Bears!! Puffy Paint! Vintage ugly Christmas sweatshirt! 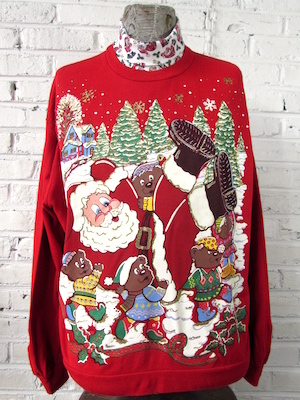 Red sweatshirt with a silly holiday scene: Santa being carried away by teddy bears dressed as elves! The group are in a wooded, snow covered landscape with one little cottage in the background. The image on the sweater is done in puffy paint with all of the gold areas of the sweatshirt finished with glitter! Sweatshirt also has an crazy cool turtleneck with printed images of tumbling Santa all over it! Tagged by Nutcracker. 100% Acrylic. Condition: Very Good. A little cracking in the puffy paint print and a little bit of pilling. Does not detract from the awesomeness of this sweater!